Today I have for you two of the six Julie G Frosted Gum Drops collection. Be sure to tune in Thursday and Saturday for the rest of the collection. I got these polishes from the Groupon Deal and then had to wait FOREVAH for them to get. Seriously, waiting on them seemed like ages. When they finally got here, my life got to busy and I couldn't get them swatched for you until now. There are six colors in this collection. Hot Cinnamon Blueberry Fizz, Tangerine Dream, Rock Candy, Sugar Rush, and Crushed Candy. Three warm colors and three cool colors. I'm going to show you one of each. Aren't you excited? First up, Hot Cinnamon. When they say "Hot" they mean it. 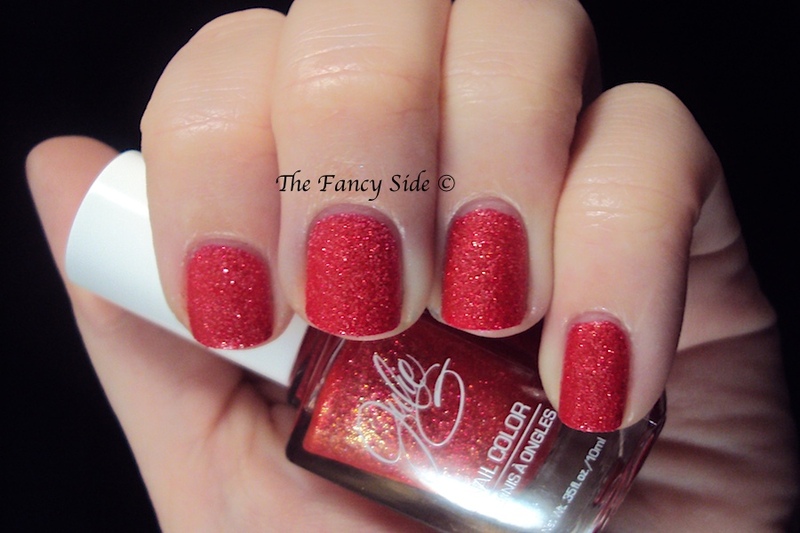 This color is a bright classic red with some tiny bits of gold sparkle thrown in. This color is a great way to stay classic but with a punch of unexpected texture. I'm in love with this color. Hot Cinnamon applies easily and you are looking at two easy coats. I did take time in between each coat to minimize dragging, but the dry time was comparable to the OPI Liquid Sand polishes that I have. The glitter/gritty pieces in these polishes are also much finer than the OPI's but I'm okay with that. :-) Lets take one more look at Hot Cinnamon. Next I'm going to show you Blueberry Fizz. To me, Blueberry Fizz looked brighter and a bit more vibrant in the bottle than it does on my nails. However, I like the color, so don't let my previous statement fool you. This is an almost light denim color with larger silver glitters mixed in. The large glitters really shine here and I love them. Dry time and application were the same here as with the first polish. Two coats and waiting in between to minimize the dragging. I really enjoy this line of polishes and I can't wait to show you the other four. Come back tomorrow to see Tangerine Dream and Rock Candy. What do you think of textured polishes? Yay or nay? I'm still voting yay on the texture trend but it's just about outwore it's welcome in my eyes. Everyone and their second cousin seem to be making textured polishes now so I'm starting to be like Okay, we get it, but at this moment, at 12:58 am on Friday May 17th I'm still liking them, although I don't know that I'll be buying any more. I agree. I like the ones I have, but unless someone comes out with a really unique shade, I'm done buying them.